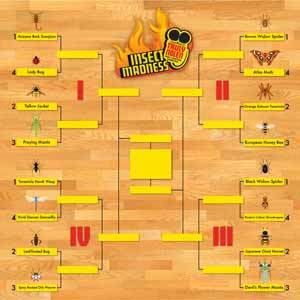 As March Madness kicked off in earnest on Thursday, Truly Nolen Pest Control is ready for this week’s Sweet 16 battles with a unique bracket of its own: the company’s first-ever TRULY Insect Madness competition. After 64 arachnids, arthropods and insects were considered for inclusion, the 16 competitors were determined through internal company crowdsourcing with a mandate to try and focus on the TRULY unique. Facebook fans of Truly Nolen will be able to help choose the winner of each matchup by voting “like” for the favorite or “love” for the underdog. Among the 16 that made the cut include the Arizona Bark Scorpion, Vivid Dancer Damselfly (which Truly Nolen helped schoolchildren in Nevada make that state’s insect in 2009), Orange Baboon Tarantula, and Devil’s Flower Mantis. Voting for the initial matchups takes place March 22–24. The eight winners will be announced March 25, with voting March 26-28. The four remaining winners will be announced March 29 with voting March 30-31. The Finalists will be announced April 1 with voting to take place April 2-4. The overall TRULY Insect Madness Winner will be announced April 5. To vote in TRULY Insect Madness, visit www.facebook.com/TrulyNolen beginning Monday, March 21, at noon for the full bracket and Tuesday, March 22, for voting instructions.